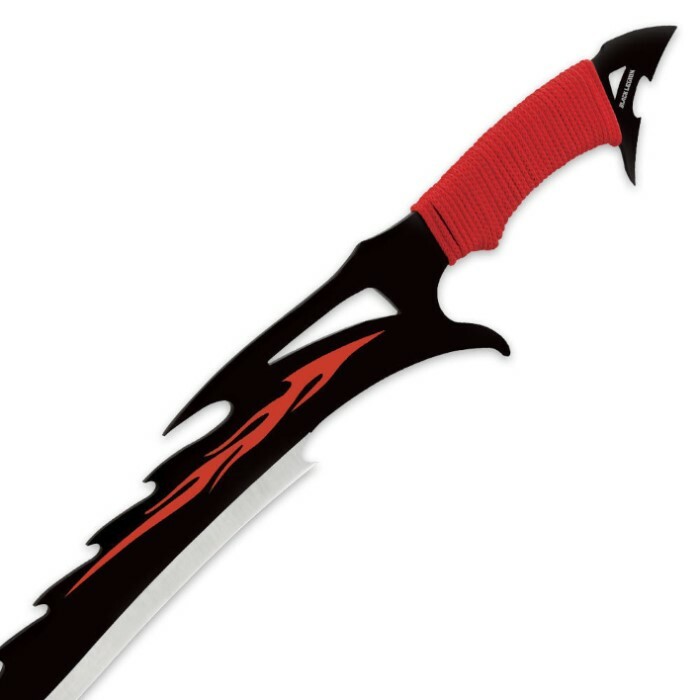 Fantasy styling meets real-world application with the incarnation of this red flame fantasy sword. The one-piece, full-tang stainless steel has a heat-treated black finish with a striking red flame motif. 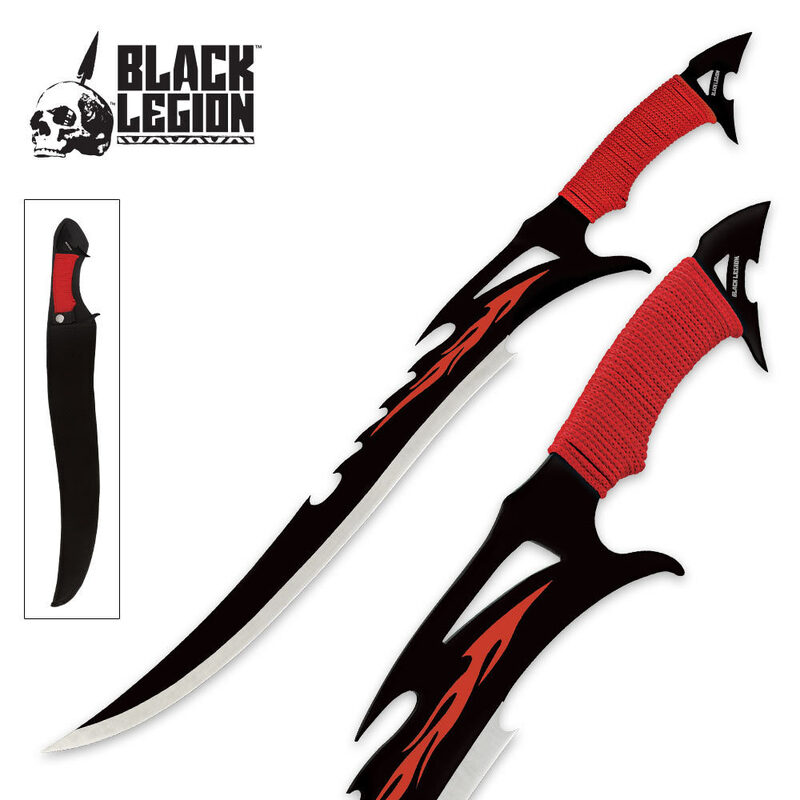 Fantasy cut outs, curves and edges give this sword tons of flair, and the razor-sharp blade edge packs tons of power. The handle is wrapped in red cord for a secure grip. 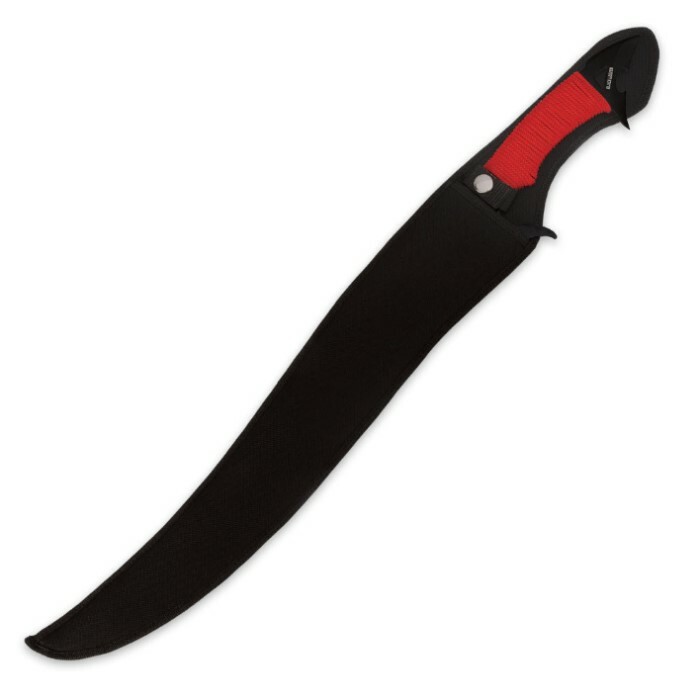 Includes a heavy-duty nylon sheath. Measures 25-3/4" overall. Other than the handle being pink, it's a good sword. points, points, points, I named it thistle. I love this little guy, another addition to the family, thank you budk!!!!!!! This sword is freakin' sick! The blade isn't razor sharp, but sharp enough to cut cardboard like paper and plywood like cardboard. All the little points on this thing are sharp so be careful when handling. The cord wrapped handle didn't come loose, but I wrapped it in electrical tape anyway to make sure it stays on. Buy this while you can! I received this sword in a mystery deal, I love the design a lot! The ties on the handle are a but loose but that was fixed easily. The sword is VERY sharp, So many spikes and points, it could be very dangerous, though it is a weapon. I love it non the less and it can easily be dulled to be "less accidental death." Overall I would give it 4.5 stars, design is great very sharp but a little too sharp for my liking (Just an opinion though), and the loose string (Can be easily fixes). Also the sheathe isn't the best quality but again the design makes up for that! just bought it.looks great i cant believe it.